Mircea Angelescu, Standarde şi Proceduri în arheologie, Bucharest: National Institute of Historical Monuments, 2004, ISBN 973-87003-2-9, 175 pages. The reason behind this work is explained in the Introduction: the existing need for an evaluation system for the "quality of the activity of an archaeologist, an archaeologists' team or a relevant institution"1. This would involve the establishment of a set of standards and procedures that would "cover all the steps that must be taken" by the "main types of activities included in the archaeological research"2. That way, the archaeological activity would have a very clear reference system based on which it could be judged. The author considers this idea as being not only one of national interest, but a Pan-European one, mentioning that the European Association of Archaeologists has been debating this issue for years. The author claims to have solved this difficult issue in Romania by publishing the above-mentioned book. The establishment of standards and procedures to be followed by those involved in archaeological research would facilitate the comparison between their respective activities. I am not going to raise the issue of whether the step proposed by the author is opportune or not in the context of Romanian archaeology, and not because it lacks in importance. But such a debate would only be pertinent were the contribution original - not in the case of plagiarism. In 1982, The Institute of Field Archaeologists (IFA) was founded in Great Britain. A description of this professional organization and its purposes can be found on its website (www.archaeologists.net).For the purposes of the present discussion, it's worth mentioning that IFA created a set of rules that are necessary for "maintaining and improving" the quality of archaeological research 3. This set of rules, entitled "Standard and Guidance", was published in 1994 and revised in 2001. Their structure, as it appears on the website (http://www.archaeologists.net/modules/icontent/index.php?page=15), is "surprising" (? 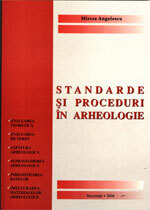 ), as you'll notice: Introduction to Standards and Guidance, Standard and Guidance for Desk-Based Assessment, Standard and Guidance for Field Evaluation, Standard and Guidance for Excavation, Standard and Guidance for an Archaeological Watching Brief, Standard and Guidance for the Archaeological Investigation and Recording of Standing Buildings or Structures, Standard and Guidance for the Collection, Documentation, Conservation and Research of Archaeological Materials, Appendices to Standards. This can be seen from the Introduction, where the author should have explained the reasoning of his work. Out of the 7 pages covered by this chapter in the Romanian version, 4 and a half pages represent a translation of the corresponding chapter from the IFA Standards, including the acknowledgements paragraph! Mircea Angelescu probably thinks that the problems faced by archaeology in Romania are pretty similar to those faced by IFA. The arguments of the British authors seem not to require anything more than completion of the author, which consist mainly of considerations regarding the evaluation of a Romanian archaeologist's activity by his peers. For the other chapters, starting with Contents down to the Appendices (except Appendix A1 and Appendix A2, the latter containing legal references), we come across paragraphs, tens of paragraphs, whole pages even, that were simply translated from the English version. The reorganization attempts, through translation and adaptation of the text, lead to a renumbering of the paragraphs, which, in turn, leads to hilarious situations: the author keeps the internal references existing in the original, which are no longer valid in the Romanian version 5! When comparing the two texts, we notice that footnotes are no longer a critical instrument necessary for completing the information provided by the book, but rather an attempt of a "makeover" of the original text through the bibliographical references, which, from a "procedural" perspective represent a "standard" of the "scientific" approach. The personal contributions (paragraphs that do not appear in the IFA standards or that are differently exploited, Appendix A1 and Appendix A2, the final part in the chapter appendices, Geodetic and Cartography Digital Data), do not change the fact that most of the work is plagiarism. This in itself cancels any kind of an impact that such a work should have on the scientific world. The management position occupied by the author when the work was published (Director of the Historical Monuments and Museums Department within the Romanian Ministry of Culture and Religious Affairs) should have made him aware of the ramifications of his gesture. Fraud should be condemned in the Romanian archaeological community, to which Mircea Angelescu belongs (or used to). Appropriating the intellectual effort of a group of people (as it is the case here) and then presenting it as a personal work (by publishing the book under his signature) is a serious offence, that discredits any other works by the same author, including his/her presumptive good intentions.